Poor credit rating is one of the foremost reasons for rejected business loan applications. In recent years, main stream banking sector has become increasingly wary of lending to small and medium businesses. A major factor behind this is the rise in non-performing assets (NPAs) marring the banking sector, which has made the banks risk-averse. Nowadays, an SME needs to have an almost perfect credit score to secure a business loan. This in turn has given rise to FinTech finance, a smarter and more efficient way of financing small and medium businesses that relies on data-driven technologies for faster loan approvals. Yet, despite their lenient approach, FinTech lenders too, assign a certain weightage to the credit score of the borrowing company. In this post, we are sharing some tips and advice that will help your firm improve its credit rating and get a business loan. Credit rating is compiled from data of your past business and credit transactions. So, if there are cases of financial irregularities in your recent past, your credit rating is going to be lower. Another factor that is reflected by your credit rating is the way in which you utilize available credit, which includes the personal credit history of payments made to credit cards, utilities, loan EMIs and mortgages. If a bulk of your income is going into such payments and your bank balances are less than ideal, the credit rating suffers. Now, improving your credit rating is a matter of setting these irregularities right. It is a time-consuming process so do not expect any miracles overnight. But by following strict financial discipline, you can regain a good credit score in a few months’ time. Refrain from applying for fresh loans when you are on the way to recovering your credit score because multiple credit searches by lenders may take away crucial points from your credit rating. 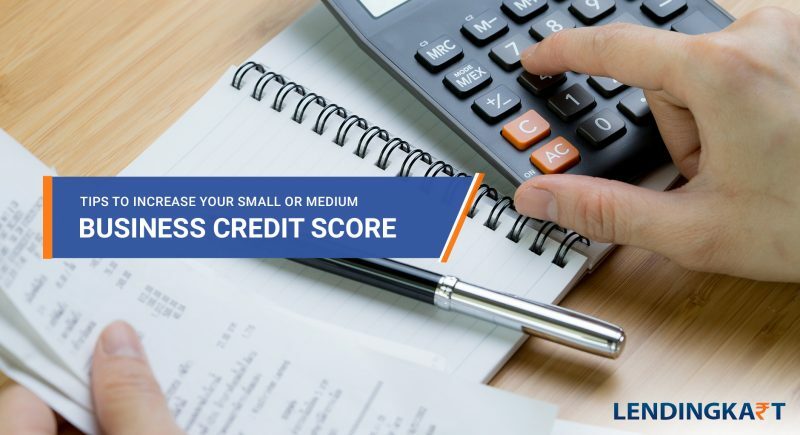 Another thing that might be affecting your business’s credit rating is wrong information uploaded by a financial institution, such as non-closure of a bank loan account that you have paid-up months ago. So, analyze your credit report carefully to identify wrong entries and raise a dispute with the rating bureau. These updates may take up to 30 days to reflect in your credit report so be patient. If you find the above-mentioned discrepancies in your credit rating, be sure to check your credit rating with other rating bureaus to see if their records are also wrong. Lastly, try and use the same address in all your business accounts to indicate legitimacy. Also, use landline numbers instead of mobile numbers as it indicates that you are a stable business establishment. Try paying more than the minimum monthly amount on your credit card loans, however, you may need to improve working capital flow for that. One way to do that is to apply for a small-ticket working capital loan when your credit rating improves to further consolidate your finances. Once you get back to a good credit score, keep an eye on it and make sure you do not slip back into old financially imprudent habits again.